Sarah, a two-year-old fawn Labrador, had recently dislocated both her hips while playing and recovery has been hard as she is overweight. This prompted her owner A Ganesan to start Pooch Aqua Gym, three weeks ago, a swimming pool, exclusively for dogs. a�?With her hip problems, it was impossible for her to walk. But she needed to lose weight, so we thought swimming would be an easier alternative,a�? says Ganesan. Dogs with orthopedic issues often find it difficult to walk for long hours without pain, and lack of exercise could lead to muscle deterioration or behaviour issues like excessive barking, chewing or even aggression. 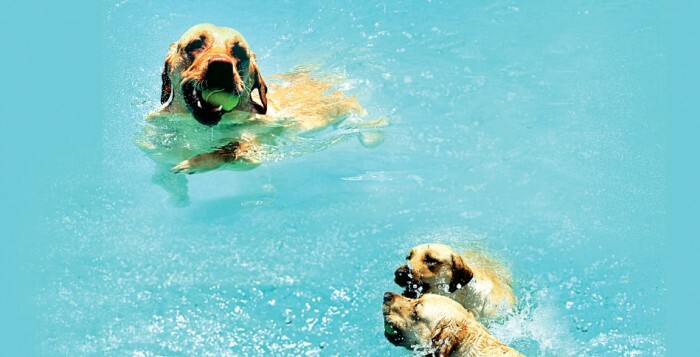 Swimming becomes a good alternative for dogs with orthopaedic problems, as it reduces strain and is a fun activity. But the Pooch Aqua Gym also targets those who love a good swim. The pool is 23ft long and 10ft wide, and can accommodate over 23 dogs at a time. A 10ft inbuilt ramp allows for easy access, especially for dogs struggling to walk that may not be able to get in and out of the pool as easily as others. Hydro-walking is another exercise that can be beneficial to dogs with joint problems as it is less painful than walking on the ground. The water level therefore, can be adjusted from five feet to a foot and a half, on request. Ganesan plans to introduce water treadmills for hydro-walking. For dogs to avail these facilities, they should not have any organ problems and must be able to swim. All first time users will be put in a life vest and personally supervised by Ganesan for a minimum of half an hour before leaving them in the pool alone. Also, there is a 1,000 sq ft play area, complete with toys to improve the dexterity of dogs. Ganesan has devised a series of exercises for dogs with hip problems with inputs from Dr Prasant Channey, a Pune-based vet and orthopaedic specialist, as well as Dr Pavan Kumar and Dr K G Amarnath, two Bangalore-based vets. If your pet is suffering from problems such as hip dysplasia, arthritis or knee pain, Ganesan will customise a workout for you inside and outside the pool after consultation with Dr Chaney. He will also be introducing monthly and quarterly packages complete with pick up and drop, so the owners do not have to worry about time or distance constraints. Over 28 dogs have made use of this pool since its launch and Ganesan sees more people signing up.